A while back, PASS halved the amount they gave to SQLSaturdays to help run these accessible conferences around the world. There will be minimal investment in the SQLSaturday platform going forward for the foreseeable future. Someone recently suggested that the organisers of events which didn’t need the $250 should give it back to fund development. I strongly disagree with this because I disagree generally with how PASS spends it’s money and I contest these $250 amounts are small fry. What I’d like to do is outline below how PASS spends it money and put into context why I think PASS as it stands today is deeply flawed in how it approaches spending. The central aim is to help it’s members increase their knowledge of the products and provide services that deliver on that goal. The Board of Directors sets the policy and strategic direction for PASS. The PASS Board of Directors shall set the direction of PASS’s management firm to ensure that activities are carried out in accordance with PASS’s goals and objectives. The volunteer Board of Directors consists of roughly 12 people right now. These people are prominent community advocates who work hard to deliver value to the community. They will be PASS Directors for a finite amount of time and have to work within the bylaws and organisational constraints they find themselves in. Mentioned only once in the bylaws with respect to the directors and given no page space on the PASS site, except in blog posts, is PASS HQ. HQ are responsible for running the day to day activities of PASS. PASS HQ is a company called Christianson & Company (PASS HQ). There are 30 current employees at C&C. I’ve previously written about turning the PASS Budget into consumable data and I’ll be using the data scraped with that technique to produce data and visualisations throughout. The latest budget is available for download as a PDF. How does PASS earn money? The vast majority of revenue comes from the PASS Summit related income streams at 93% of all revenue. PASS is critically dependent on a single revenue stream that must stay relevant and worthwhile for attendees. How does PASS spend money? The Expenses lines of the FY2018 budget total $9,212,223. PASS’ budget says they expect their expenses to exceed their revenue by $354,469 in FY2018. PASS Summit related expenses account for 44% of all expenses, meaning that PASS expect to roughly double their money on anything they spend directly on PASS Summit. PASS directly attributed 50.5% of it’s budgeted outgoings or $4,648,326 in FY2018 to community activities. The remaining expenses go on central costs like management, IT, and board support. Of the 49%, or $4,563,896, the amount that is covered under Management i.e. the activity of the C&C is 80% of this expense or $3,666,154. C&C are based in Vancouver. If we tried to infer how much work they do per day for that management cost, we could look at the average cost of staff in that area. An average software developer at USD$50,000 per year or, spread over 365 days like the running cost, $137 per day. Assuming some overhead for taxes etc we could round up to $150 per day. If PASS were directly hiring people they could pay 67 Vancouverites for the daily management cost, versus the 30 on the C&C payroll. Obviously a company has to make profits, so we would not expect C&C to be charging PASS just what they pay their staff, however, doubling the cost of staff is rather on the high side and taking bonuses seems too much to me. According to available Board Minutes, PASS HQ supported 50,000 unique people in FY2018. That’s a pretty impressive number. 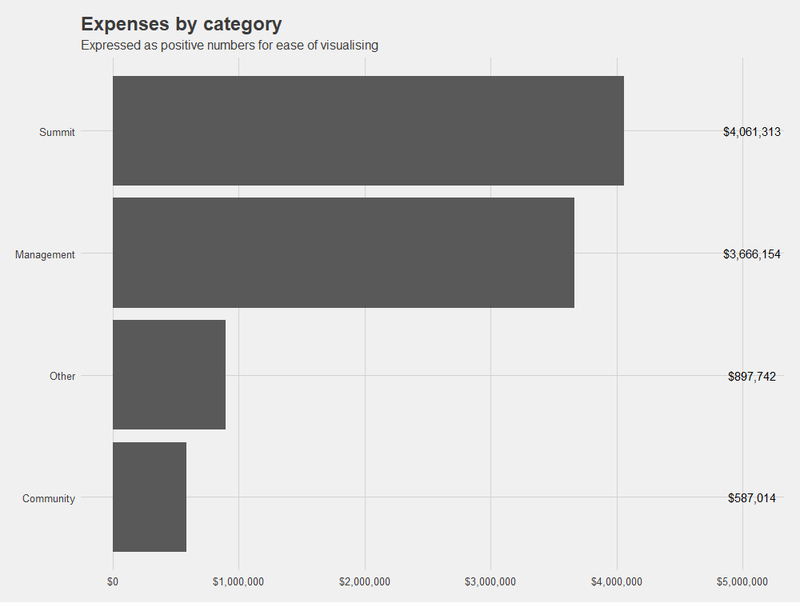 Expenses by category. Management line items within a community department get counted as a departmental expenses. The distribution of these costs is fundamentally off to me. The closest comparison for me are charities and not-for-profits. The percentage of their funds that go to supporting HQ versus their stated goals gets ranked so folks can decide whether they should donate to a charity. At CharityWatch, a charity that spends 49% of it’s revenue on management and overheads would be given a C-. I mentioned the deficit PASS are running at. To start earning more than they spend, enabling strong reserves and buffers against issues, PASS need to cut outgoing by 3.8%. PASS have cut funding to the non-Summit communities in the past like SQLSaturdays and I often see suggestions that PASS will cut stuff again. Applying the 4% cut to the mere 6% of the budget that is the non-Summit community activities would destroy these initiatives. As these are the global activities, this is also where the bulk of those 50,000 people engage with PASS. PASS exists to deliver these services and any cutting of them goes against the stated aims of PASS and should only be considered as a last resort. Of PASS’ costs 49% are for the central function and general service delivery This is the place for cuts. For instance, if the management firm forgo their incentives for a year, that removes $182,554 of deficit all by itself. I see no suggestion of a critical eye on the management firm’s cost in the recent Board minutes or outgoing communications. The unwillingness to cut this cost has an organisation that generates $9m in revenue run at a loss, endangering the existence of an initiative that is helping 50,000 people a year up their skills, the vast majority of whom are being helped on just 6% of the expenses. Grant outlined that the PASS organization is extremely strong, recognizing the single best resource as Christianson & Company. Grant thanked the C&C team and stated that C&C is PASS. I have to disagree with Grant Fritchey, who I hold a lot of respect for. PASS is not strong, PASS is losing money. PASS is not C&C, PASS is the community. PASS needs to be more ruthless about the HQ to survive. I know almost every person who has sat on the Board of Directors for the past 5 years. I know that all of these people are community spirited who keep their eye on helping those 50,000 people around the world and growing that number. I know that no service is ever free and that someone has to manage PASS. I hope that this analysis of the PASS budget and the outlining of my thinking will help refocus the discussion towards how PASS can reduce central costs and increase funding longer term to community activities. Founder of a consultancy that helps organisations start doing data science, Steph spends her time helping others learn and grow.